The Syria conflict has now killed nearly a quarter of a million people and displaced roughly 12 million. 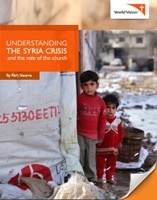 On the fifth year anniversary of the conflict, a short new ebook by Rich Stearns, World Vision U.S. president, explores questions of how we, especially the Church, can be more than a band-aid on a gaping wound in the Middle East. He offers an overview of the crisis, first-hand accounts from visits with refugees in the countries surrounding Syria, and reasons we can make a difference for families who are suffering.